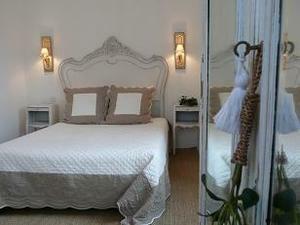 Two delightful bedrooms on the first floor, bright and comfortable: The room "Celeste" offers a double bed. The room "Garance" offers two 80 cm beds which can be combined into one double bed. The two rooms share a bathroom with a toilet on the first floor. At the ground floor, a sitting room with a warm atmosphere, with a 1 person bed, a kitchen dining room for 4 to 5 persons, equipped (refrigerator, gas stove, oven, washing machine and dishwasher), and other toilets.